If you are looking for the Joint Task Force for Clinical Trial Competency website, please click here. We are working to standardize the competence required of clinical research professionals through the multi-stakeholder Joint Task Force for Clinical Trial Competency. By establishing a broadly supported set of competencies in core domains, we aim to lead standardization in the clinical trial workforce and support its ongoing development through competence-based education and training. Encompasses study management and GCP compliance; safety management (adverse event identification and reporting, postmarket surveillance, and pharmacovigilance), and handling of investigational product. Encompasses all elements of communication within the site and between the site and sponsor, CRO, and regulators. Understanding of teamwork skills necessary for conducting a clinical trial. Encompasses how data are acquired and managed during a clinical trial, including source data, data entry, queries, quality control, and correction and the concept of a locked database. Encompasses care of patients, aspects of human subject protection, and safety in the conduct of a clinical trial. Encompasses knowledge of how drugs, devices, and biologicals are developed and regulated. Encompasses knowledge of scientific concepts related to the design and analysis of clinical trials. Encompasses content required at the site level to run a study (financial and personnel aspects). Includes site and study operations (not encompassing regulatory/GCPs). In an attempt to bring together disparate, but high-quality efforts focused on clinical trial competence, a meeting of representatives from pharmaceutical companies, contract research organizations, academic institutions, clinical research sites, and professional societies was hosted by the Multi-Regional Clinical Trial (MRCT) Center at Harvard University during spring 2013. A broad-based and widely representative group was formed and named the Joint Task Force (JTF) for Clinical Trial Competency. The members of the JTF agreed to work toward aligning and harmonizing the many focused statements relating to core competency for clinical research professionals into a single, high-level set of standards, which could be adopted globally and serve as a framework for defining professional competency throughout the clinical research enterprise. The JTF had a second face-to-face meeting in June 2013, which included participants from an even broader representation of the clinical research community. The JTF then worked through the summer of 2013 and presented its final report in October of that year. The process used by the JTF was designed to acknowledge and incorporate the inputs from the many participating organizations. 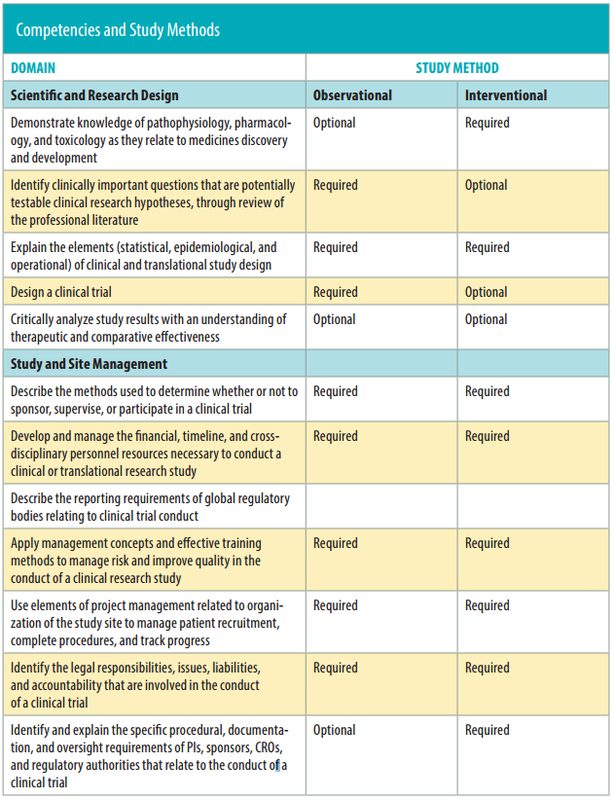 It required a review of the many different competency statements and identification of competency domains, or broad categories of the knowledge, skills, and attitudes necessary to function within the field of clinical research. It determined that all of the competency statements could be aligned within the eight competency domains. The Core Competency Framework can be used in many ways toward improving the quality and safety of the clinical research enterprise, such as to define certification criteria used by personnel or site certifying agencies. The framework also could be used to formulate accreditation standards for academic programs, both to standardize curricula and to ensure that programs are sufficiently comprehensive. Ultimately though, the most effective method to improve clinical trials would be to ensure that those responsible for the various aspects of the clinical trial bring the appropriate competence at the appropriate time. The greater challenge is implementation of this conceptual framework into an operational model, and a good place to start could be the clinical research design, whereby a look at competencies across two different types of studies can reveal variability in requirements. For instance, comparing an investigatorinitiated, observational trial to an industry-sponsored, premarket interventional trial illustrates how this framework might be used to qualify a PI. As depicted right, the competencies for the Study and Site Management Domain are identical in the two different styles of trial, but not so for the Scientific and Research Design Domain. This does not imply that a less competent investigator can perform an observational study, but that a lower level of competency is required for that study method. Furthermore, the level of competency might be quite different for other clinical research team roles, such as CRC, CRA, data manager, or regulatory affairs coordinator. Once the necessary competency is defined, the PI, study sponsor, and interested regulatory authority must ensure that the study team member possesses the necessary competencies to carry out the selected, protocol-defined tasks. If additional knowledge or skills are needed, this would be the proper place to integrate with training programs that have training materials and processes that are harmonized to the protocol-specific competency requirements.